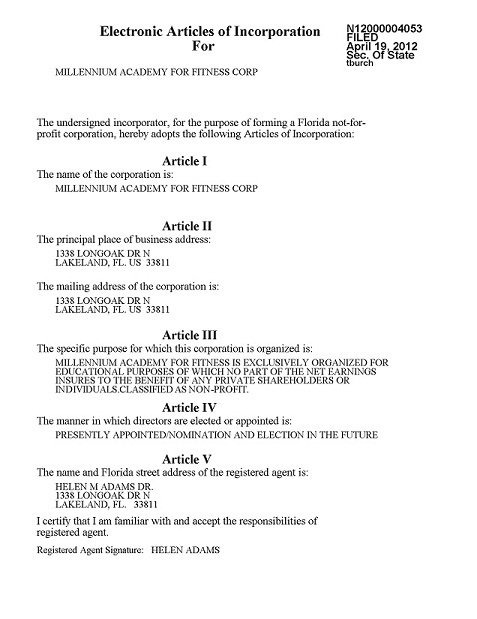 I certify the attached is a true and correct copy of the Articles of Incorporation of MILLENNIUM ACADEMY FOR FITNESS CORP, a Florida corporation, filed electronically on April 19, 2012 effective April 18, 2012, as shown by the records of this office. I further certify that this is an electronically transmitted certificate authorized by section 15.16, Florida Statutes, and authenticated by the code noted below. The document number of this corporation is N12000004053.